Suddenly all the roses are in bloom. 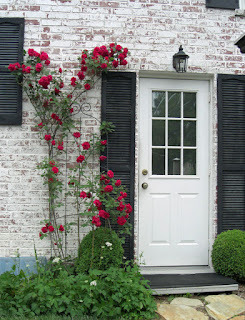 I cannot resist stopping to smell every shrub and have been known to trespass---just a little---to get a better look at an especially alluring rose. This scene did not require such measures. Here at the front entrance, red, black and white, that reliably successful color scheme, imparts drama and crispness. The texture of the painted bricks and the graceful lines of the blossom-laden stems add a cozy welcoming feeling. Don't you wish this was your front door? I sure do.